Over the weekend, an internal document from Staples hinted at which dates we can expect to see the Galaxy S4 become available on three out of the four major U.S. carriers. 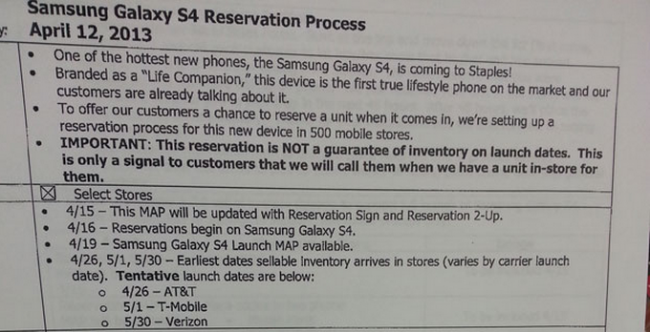 According to the sheet, AT&T will first receive Samsung’s next flagship starting April 26, followed by T-Mobile on May 1 and Verizon a whole month later on May 30. The dates for AT&T align quite well, given that AT&T confirmed pre-orders would begin tomorrow, the 16th. In the pictured document, it shows that employees should begin prepping in-store signage for reservations starting April 16. Given its nature, I wouldn’t place any bets on these dates quite yet, but at least it’s a start.